I’ve got that Friday feeling – when you feel your work is almost done and the weekend is about to begin. It’s odd but strangely pleasant as I officially finished my working week on Wednesday! I have no plans for tonight and a quiet weekend ahead of me. The weather forecast is cold, wet, maybe even with a flurry of snow. I have yarn and needles, food in the cupboard, family at home, so I think I am all set for a happy few days. When I worked full time away from home years ago this time of day (mid afternoon on a Friday) brought excitement and anticipation to the fore. It often brought sheer panic at the same time as I looked at how much work needed to be completed before I could shut up the office and head home! There were many times weekends started at 5.05pm on a Friday night with a few drinks in the pub before getting a later train home. There were other times when I dashed home as fast as possible and speedily changed into my glad-rags ready to go straight out again. Then there were some Fridays where I called in the curry house on the way home to place an order for a meal to be delivered half an hour later once I’d reached home and put my cosy clothes on for a lazy evening on the sofa! Then there were Fridays with a toddler at my ankles, those Fridays where I couldn’t wait for my hubby to get home and takeover the childcare. Oh what a lot of different Fridays there have been. I could go on and on ..
What about now? What about recent Fridays? Well, Fridays are just for me. I can be selfish on Fridays during the day. I consider myself very lucky on Fridays. Sometimes I stay in my pjs a bit longer than other days, maybe even watch some breakfast tv followed by a little daytime tv too. Fridays can be for catching up with friends and/or chores or I can create things for pleasure or to sell ‘one day’. I decide how to spend my Fridays and luckily at the moment this does not involve working elsewhere. So today, coffee and a giggle with a friend, a trip to the gym (to work off the almond croissant eaten with the friend), homemade soup for a late lunch sitting on the sofa followed by a little knitting. Sadly the knitting became a mini disaster but I didn’t let that bother me, no, not on a Friday! The end of the day will hopefully be just as indulgent. This entry was posted in Uncategorized and tagged cosy, craft, create, friday, homemade soup, knit, toddler. What was on my needles this weekend? 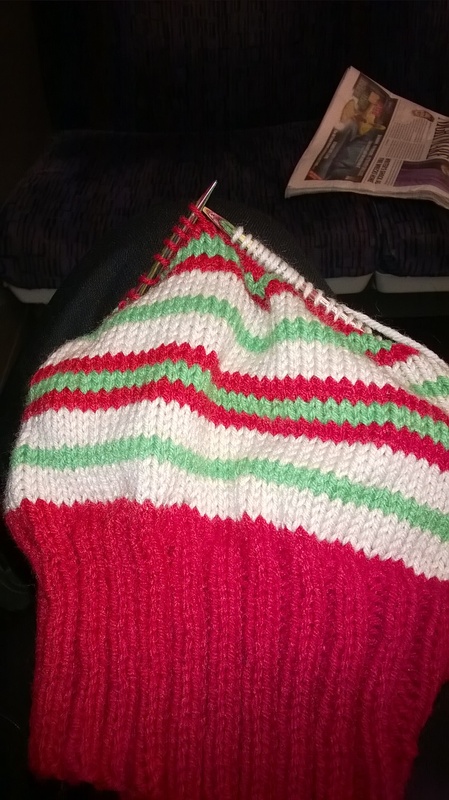 A treat of a weekend – I actually knitted for myself! I have the back and half a front of a chunky pink cardigan just for me, yay! I had been putting other projects first for a couple of weeks. 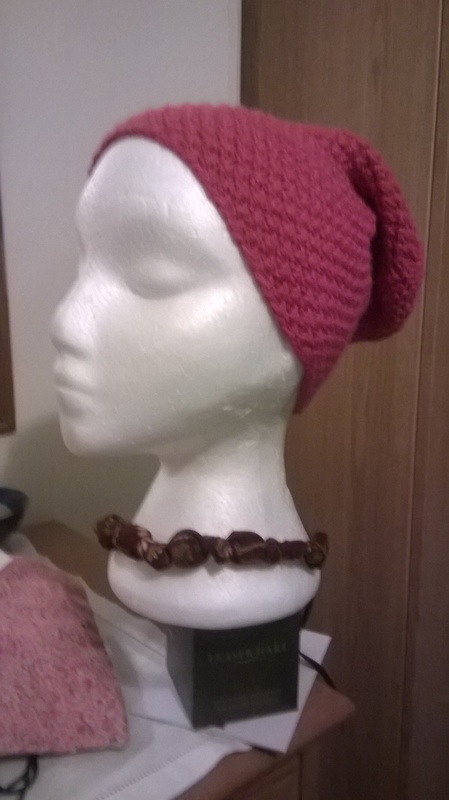 If I switch between little hats to sell and this one big project I might actually finish it in time to wear this winter. I love the colour but I am not loving the wool, sadly. I hope it grows on me as it grows on the needles. It was a reasonable priced yarn and I thought I would give it a try based on the colour alone, not something I would usually do (Cascade Pacific Chunky). That’s the one thing with shopping online for yarn and textiles. I like the convenience of shopping on line and do it a lot, but I also like visiting stores to stroke and squish wools and fabrics. Thank goodness I am lucky enough to be able to do both (and often do which leads to a stash to rival knitting and haberdashery shops!). This weekend also confirmed I don’t much like knitting on long, plastic needles. I haven’t knitted on plastic needles regularly for years, usually opting for bamboo or rosewood from my collection. The pink yarn cast on needed quite a long needle and at the cast on stage these 35mm Pony needles were just handily poking out from one of my needle rolls (having had a slight accident knocking the needle roll off the shelf the day before). I quickly switched to birch for both the smoothness, weight and also these ones are very pretty too, being a rosy pink to match the yarn! The yarn just didn’t travel along smoothly for me on the plastic needles. Knitting needles are an item of choice for everyone and it is not for me to tell anyone to avoid them, however I know I will not choose plastic ones if I can help it for future projects. So, no photo of the pink one yet but here’s a taste of a current hat – this one will be for a 6-12month old baby, rather vintage don’t you think? Using a Knitpro circular needle here. What’s on others’ needles this week? This entry was posted in Uncategorized and tagged cascade pacific, haberdashery, hat, knit, knitpro, stash, textiles, vintage, wool, yarn. I took a step back as the calendar changed to 2015. I didn’t launch head long into making huge changes or decisions. I am too aware of years gone past where I have made promises to myself that were either impossible to keep or just petered out after a few days or weeks. Therefore there was no blog post directly on 1st January, no New Years Resolutions as such, although it did make me muse about the future. I got to thinking about something an old work colleague said when I was quite young. I didn’t ‘get it’ at the time, in fact I thought he was just being tight. St Valentine’s Day was approaching and I was anticipating dinner out with a fairly new boyfriend. My colleague said St Valentine’s Day was an excuse for retailers and restaurants to bump up their prices and overcharge everybody. He also said the media encouraged us to make sure we said ‘I Love You’ on that one day whereas he said it to his wife everyday (lucky wife!). I wondered why he questioned being told to say ‘I Love You’ at all. I guess you can possibly say similar rules apply to New Year’s Eve celebrations. Don’t get me wrong here. I am not bah humbug at all about New Year. I love New Year! I have very happy memories of being proposed to and accepting as one year turned into another. I have great memories of parties and other celebrations with friends here and abroad as clocks changed. However, it is so true that many restaurants charge a lot extra to eat out on 31st December, many supermarkets bring out ‘special’ food (sometimes more expensive too) for the same date. Yes, you have to factor in paying staff, keeping venues open out of hours, but is it really overdone these days? And, why is it that people take this date to review the past year and make changes? Why don’t we do it on May 3rd, September 7th or any other date? Historically it was when the calendar was reset in the 1500’s but mostly nowadays it revolves around making keep fit decisions rather than being farmers and being aware of the seasons! I had been thinking I was barely keeping my head above water for some time. November became rather a blur. I had been working hard, newish job, lots to learn. I had been trying to juggle home life, being a good wife and mother. I was struggling to keep healthy and to keep off the pounds I had lost in the past 18 months. It all seemed to work but I was exhausted and not enjoying most things. The seeds of change were planted in November, which did mean a change of working hours before Christmas, for the better. December, amongst the juggling, obligatory family stuff took place. As always we came out of Christmas feeling we had done our bit for the season but this year I felt flat and pushed and pulled every which way. So, between Christmas and New Year I started to take stock of my life at ‘the moment’, not particularly long term but ‘for now’. I am part of an online knitting forum but had taken on board more commitment on it for three years. I decided to give that up, enjoy some time for me on the forum. I didn’t want to dash fellow knitters hopes but had to put myself first this time and it feels good that I have. Secondly, I decided to try and sell some of my knitted things again. There was an opportunity proposed to me in Spring 2014, I hadn’t taken it up but I have done so now. It is very casual but in a week I have sold 25% of my items – which to me is good news. I still dash from day to day but sometimes consciously stop and ‘smell the roses’. For example, on the train platform the other day I was surrounded by fellow commuters, six of which in the near vicinity were wearing headphones. They all seemed unaware of their surrounding. I stood waiting for the train, basking in the sunshine streaming down upon us, just taking stock of the start of the day and felt calm and relaxed when the train arrived. A couple of pics just for show off ! A trip to Greenwich in London pre Christmas. 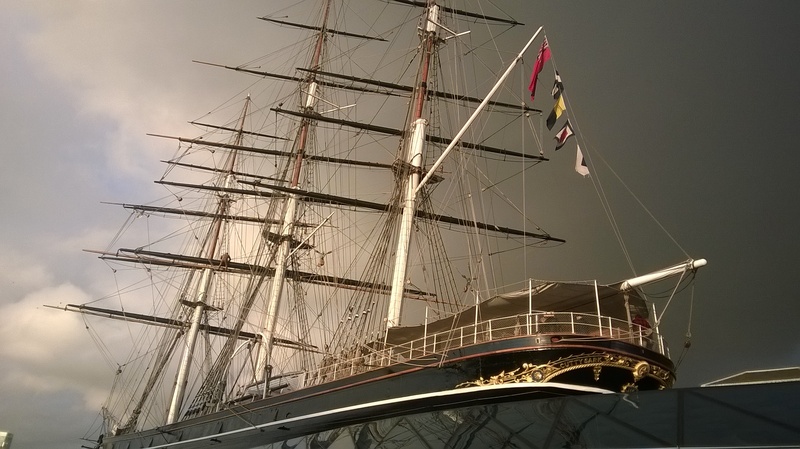 A lovely snap of The Cutty Sark. Well worth a visit if you are up that way. 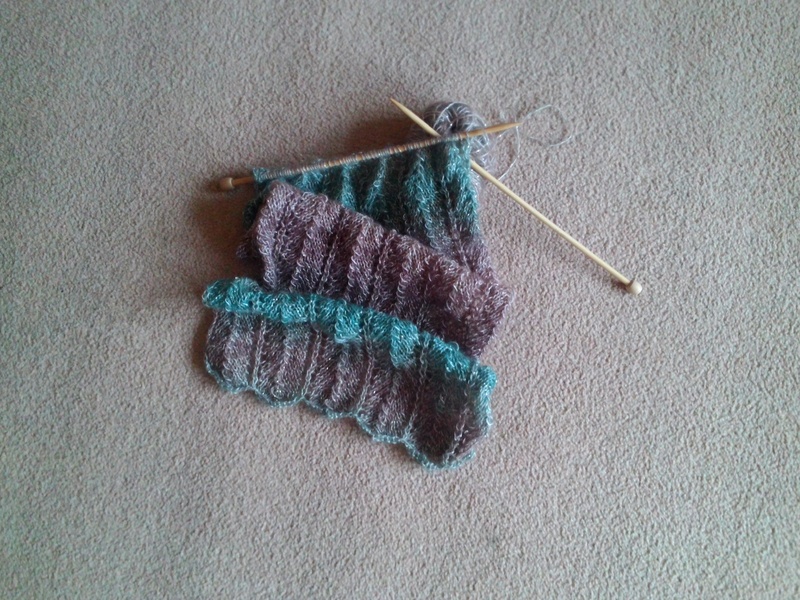 And a little bit of knitting, though photo a bit rubbish – oops! More knitty pictures will be uploaded soon. This entry was posted in Uncategorized and tagged commuters, january, knit, knitty, resolutions.